For precision temperature sensing, nothing beats a Platinum RTD. 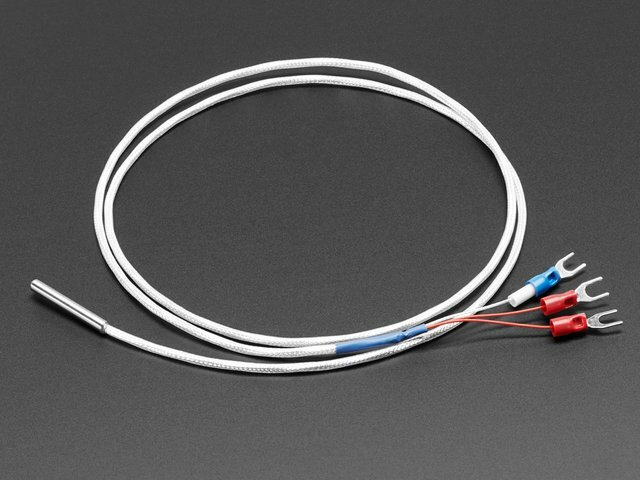 Resistance temperature detectors (RTDs) are temperature sensors that contain a resistor that changes resistance value as its temperature changes, basically a kind of thermistor. In this sensor, the resistor is actually a small strip of Platinum with a resistance of 100 or 1000 ohms at 0°C, thus the name PT100/PT1000. Compared to most NTC/PTC thermistors, the PT type of RTD is much more stable and precise (but also more expensive) PT's have been used for many years to measure temperature in laboratory and industrial processes, and have developed a reputation for accuracy (better than thermocouples), repeatability, and stability. However, to get that precision and accuracy out of your PT100x RTD you must use an amplifier that is designed to read the low resistance. Better yet, have an amplifier that can automatically adjust and compensate for the resistance of the connecting wires. 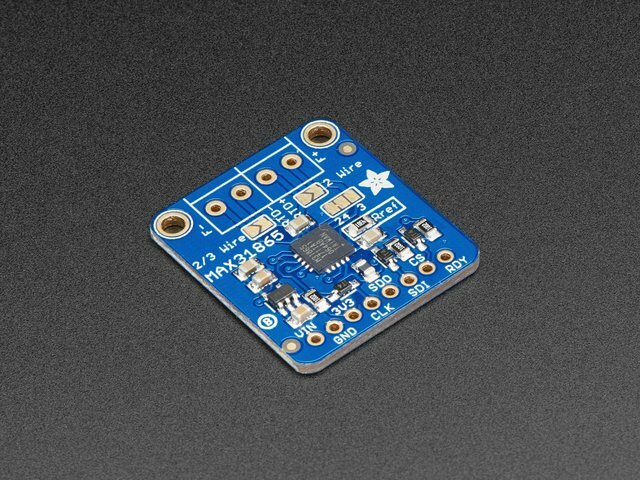 If you're looking for a great RTD sensor, today is your lucky day because we have a lovely Adafruit RTD Sensor Amplifier with the MAX31865 sensor. 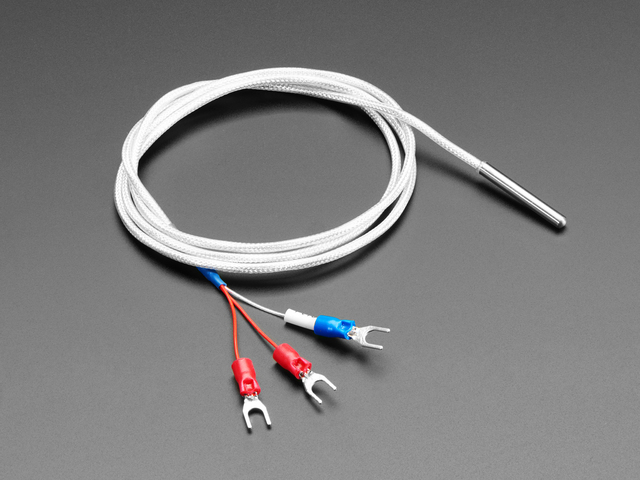 We've carried various MAXIM thermocouple amplifiers and they're great - but thermocouples don't have the best accuracy or precision, for when the readings must be as good as can be. The MAX31865 handles all of your RTD needs, and can even compensate 3 or 4 wire RTDs for better accuracy. Connect to it with any microcontroller over SPI and read out the resistance ratio from the internal ADC. We put a 0.1% resistor as a reference resistor on the breakout. We have some example code that will calcuate the temperature based on the resistance for you. 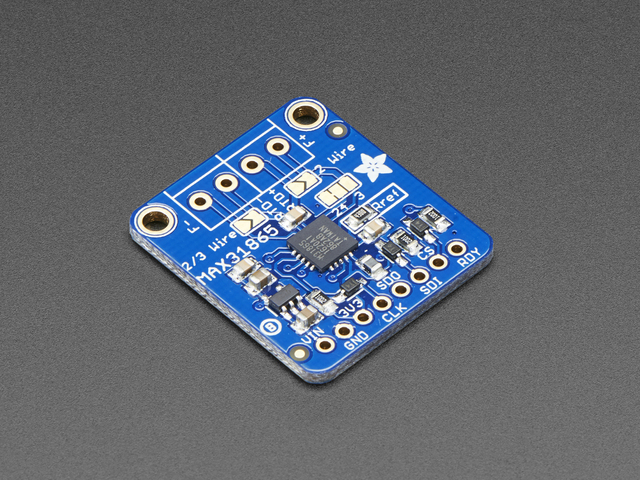 Each order comes with one assembled RTD amplifier breakout board. Also comes with two 2-pin terminal blocks (for connecting to the RTD sensor) and pin header (to plug into any breadboard or perfboard). A required PT100 or PT1000 RTD is not included! (But we stock them in the shop). Some soldering is required to solder the headers and terminal blocks to the breakout, but it's an easy task with soldering tools. This guide was first published on Nov 15, 2016. It was last updated on Nov 15, 2016. This page (Overview) was last updated on Apr 26, 2019.